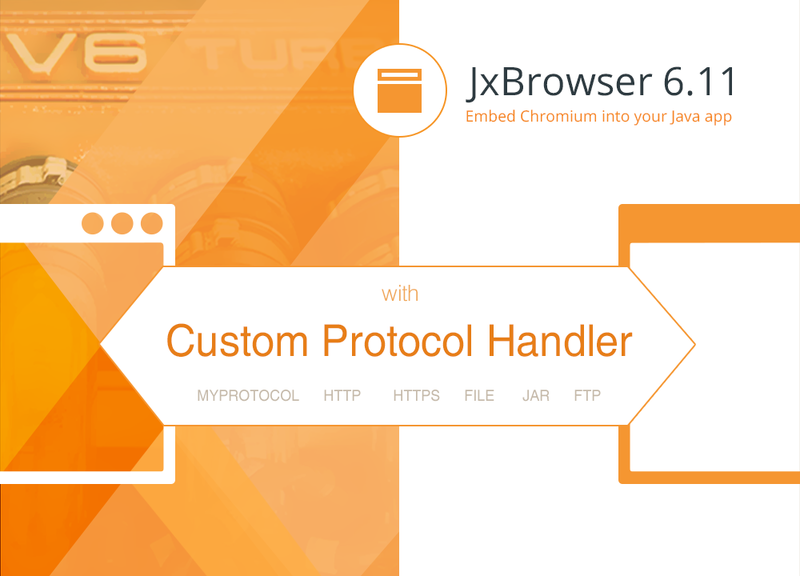 Today we are glad to introduce JxBrowser 6.11 with long awaited custom protocol handler feature. It allows intercepting URL requests/responses for standard protocols such as HTTP, HTTPS, FTP, etc., and custom non-standard protocols (e.g. JAR). You may have also noticed, that new versions of JxBrowser are now published more often. We do believe, that requested features and updates should be delivered, and go live as soon as possible. This is why we decided to release a new JxBrowser version every two weeks instead of once a month to provide you with the latest improvements, fixes, and new features. We would like to thank all JxBrowser users for your requests and feedback. They help us make the library more suitable for your needs with each release. Take a look at JxBrowser Release Notes for detailed information of every update of the library, and stay tuned for more product news! 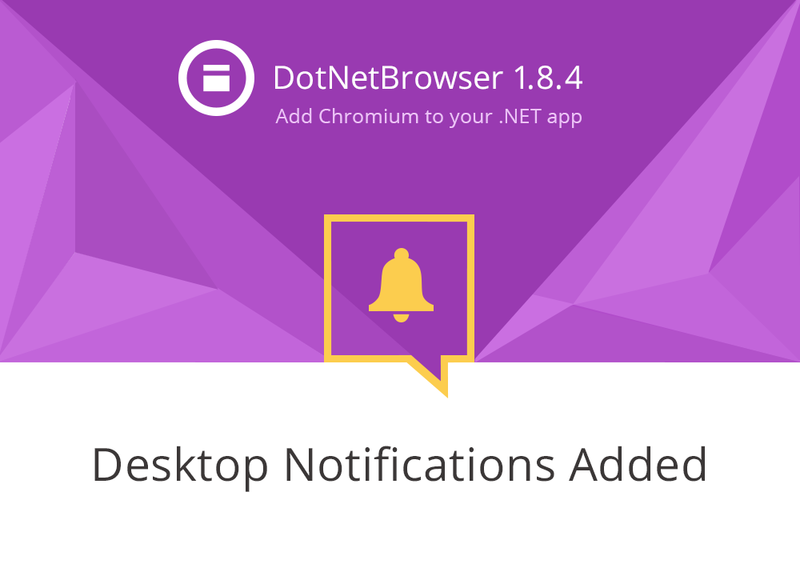 Today we are glad to announce the new version of DotNetBrowser packed with useful new features like Desktop Notifications, Permission Requests, Spell Checking, and more. The update is available for download on the product page. Let us know what you think about the new version. Our tag for questions on StackOverflow is #dotnetbrowser. The new version of JxBrowser is focused around enhancing the Lightweight rendering mode: it got an ability to display transparent background on a web page, and a way better performance. Have a look at the details of the release and give it a try in your own project! The fresh 1.8.3 version of DotNetBrowser features performance improvements, extended DOM API and useful new features and fixes. Visit the Release Notes page for the full change record or download the update and try it out straight away. We'd be glad to discuss your thoughts and comments via email or under #dotnetbrowser tag on Stack Overflow. JxBrowser 6.8 is available for download. In this update we extended JxBrowser API with new features. Here are just a few to name: HTML5 Desktop Notifications API, incognito mode, voice recognition, HTTP server whitelist, @JSAccessible, etc. The version also contains fixes for several issues, reported by our customers. For the full list of new features and improvements in this update, please see the Release Notes. We’re excited as everyone with the advent of macOS Sierra, so we keep tuning our products up to support this operating system. 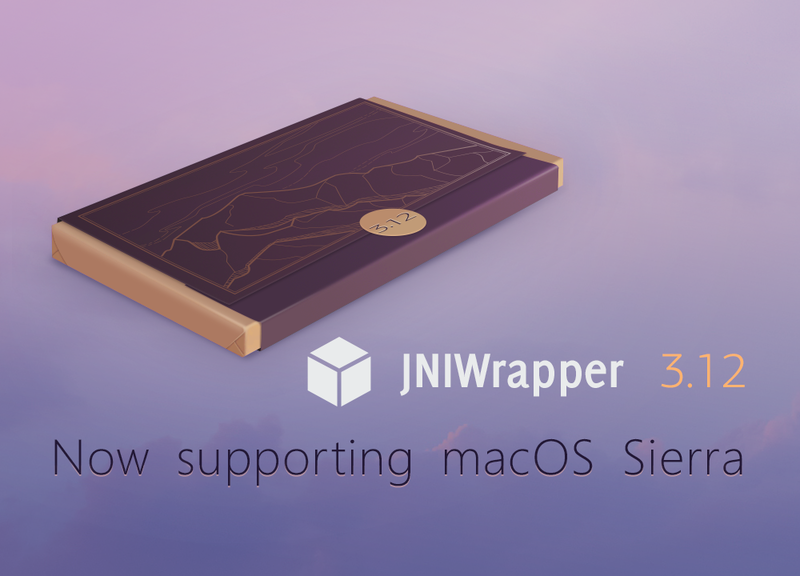 Today it is JNIWrapper’s turn. Version 3.12 with macOS 10.12 support is ready and available for download. We’d be happy to address all your thoughts and comments on the new version on the Support Forum. 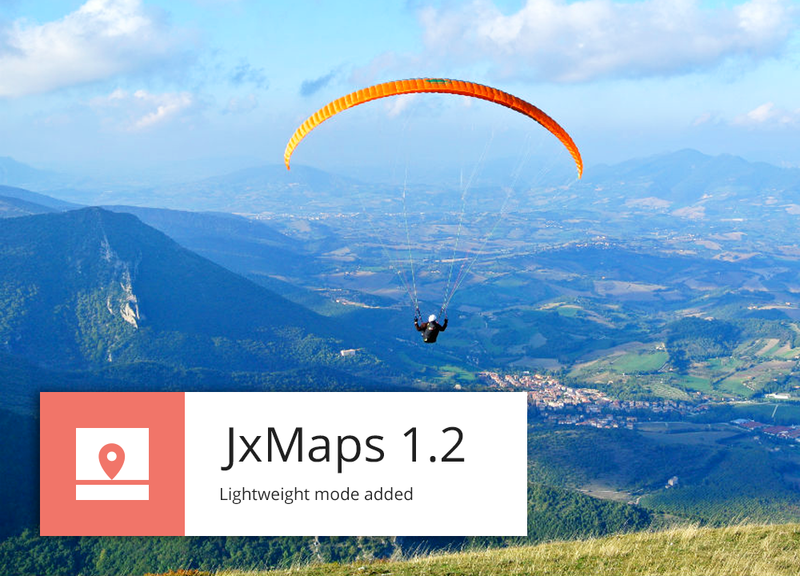 JxMaps 1.2 is available for download. The update is based on the newest version of Google Maps API (v 3.25), and features several improvements for ease and flexibility of use. See the Release Notes for the full list of changes in the new version. The new version is available for download from the product page. For the full list of changes, please see the Release Notes. JxBrowser 6.7.1 with macOS Sierra Support is Out! JxBrowser 6.7.1 is now available for download. This update features support of the recently released macOS Sierra. In this version we also resolved several important issues such as incorrect rendering on HiDPI monitors on Windows platforms with JavaFX, the RejectedExecutionException error in multithreaded environment when disposing Browser instance, the issue when only one embedded PDF document can be printed, etc. For the full list of improvements in this minor update, please see the Release Notes. Version 1.2 of JxDocument is Released! 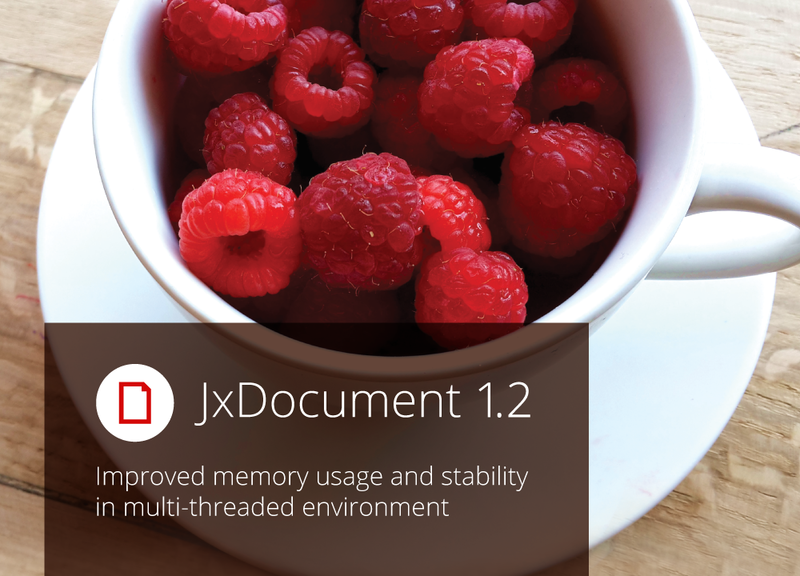 We’re glad to announce that JxDocument continues to evolve and today it turned 1.2. The update is available for download on the product page. This version can boast improved memory usage and stability of the library in the multi-threaded environment. For the full list of improvements in this update, please see the Release Notes. JExplorer 3.4 is now available for download. In this minor update we have added support of Windows Server 2003 platform and pop up management functionality, and fixed several issues reported by our customers. The full list of changes in this version is available in the Release Notes. We would also like to remind you, that since January 12, 2016 Microsoft does not support any versions of the JExplorer’s underlying technology — Internet Explorer, except the last one. If you prefer not to wait for the inevitable, and make the necessary changes in advance, we have prepared a transition offer for all JExplorer licence owners. 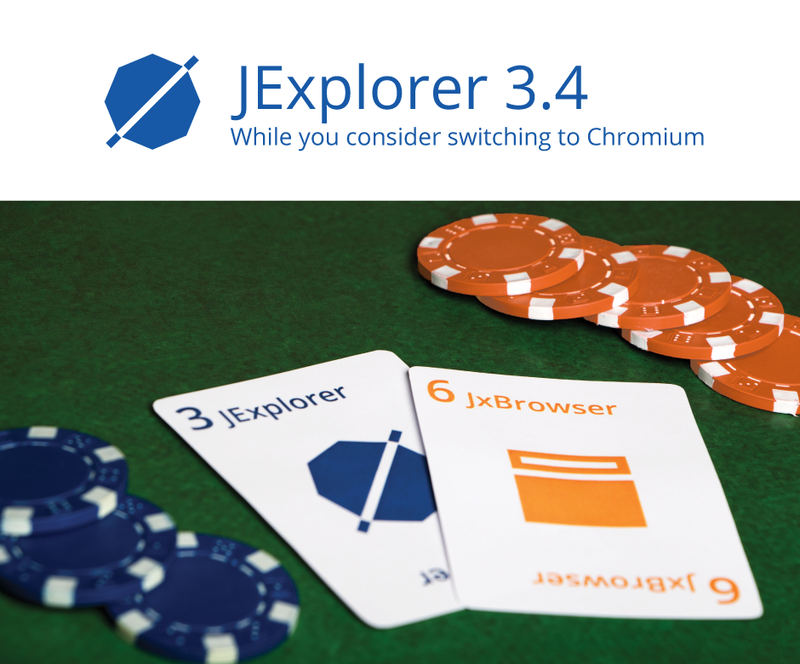 Now you can move from JExplorer to JxBrowser — a Java browser component, based on Chromium, with a 25% discount, and enrich your Java app with any feature the modern web can offer. 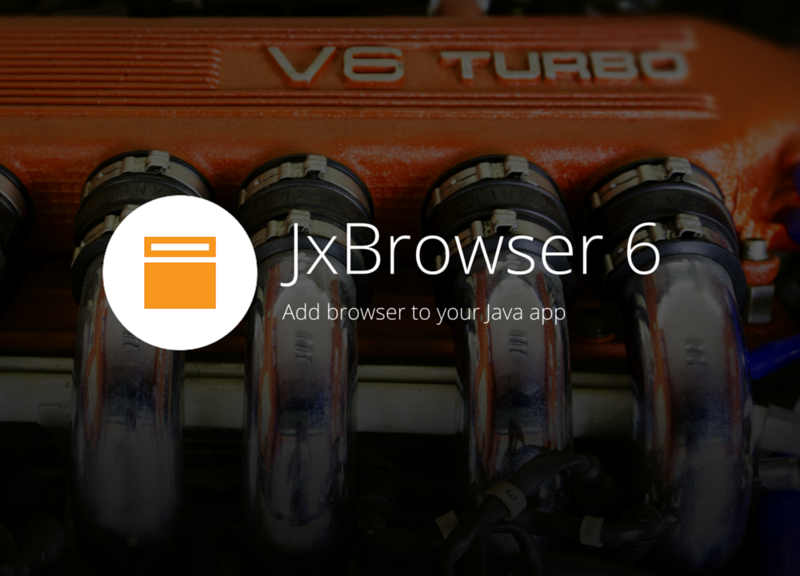 A slimmer and more efficient JxBrowser 6.7 is available! 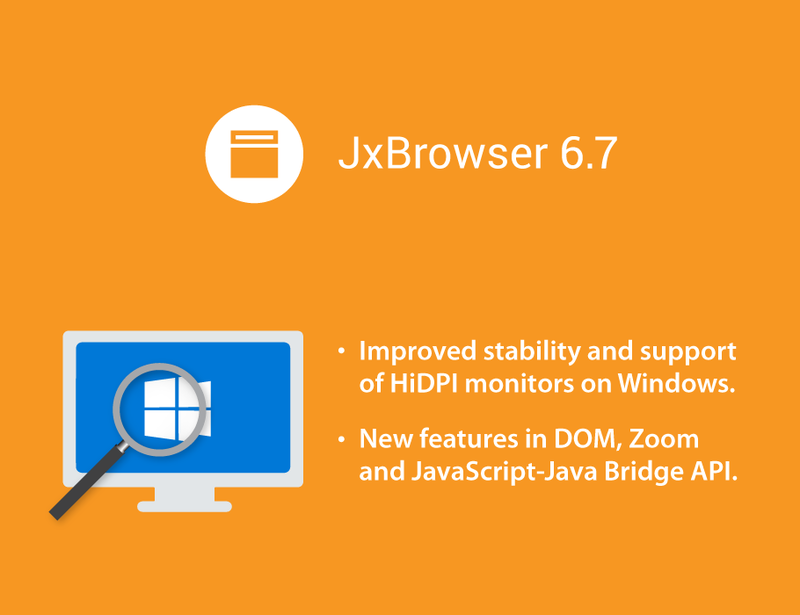 JxBrowser 6.7 is now available for download. Please note that starting from 6.7 version, the JxBrowser logging level is set to SEVERE by default instead of ALL (in previous versions). According to your feedback, you prefer that JxBrowser doesn’t print all log messages into console output by default. 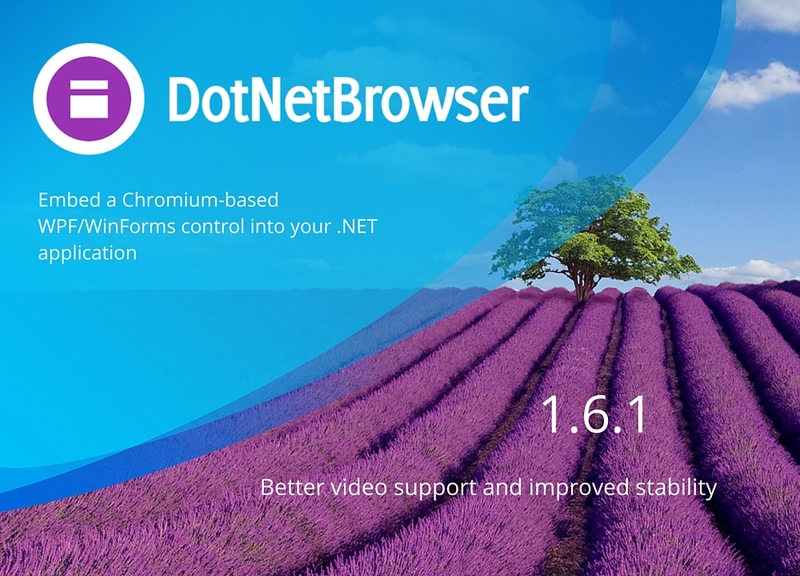 Get a grip of DOM in your .NET apps with DotNetBrowser 1.8.1! 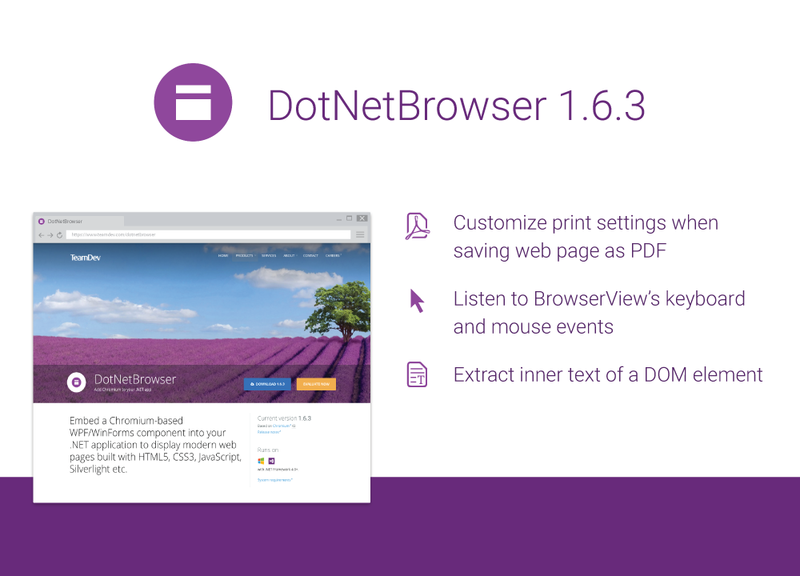 DotNetBrowser 1.8.1, featuring the long-awaited DOM API update is available for download. Now it is possible to create and modify DOM nodes, emulate custom DOM events for the specific DOM elements and get the DOM node at the particular location on the page. This version also contains a bunch of other useful features and improvements, providing even smoother experience of using DotNetBrowser in .NET projects. See the full list of changes on the Release Notes page. We'd love to hear your thoughts and comments on the new version in comments. If you prefer a more private mode of conversation, drop us a line to email, provided in the evaluation confirmation letter. This week is quite reach for new releases! 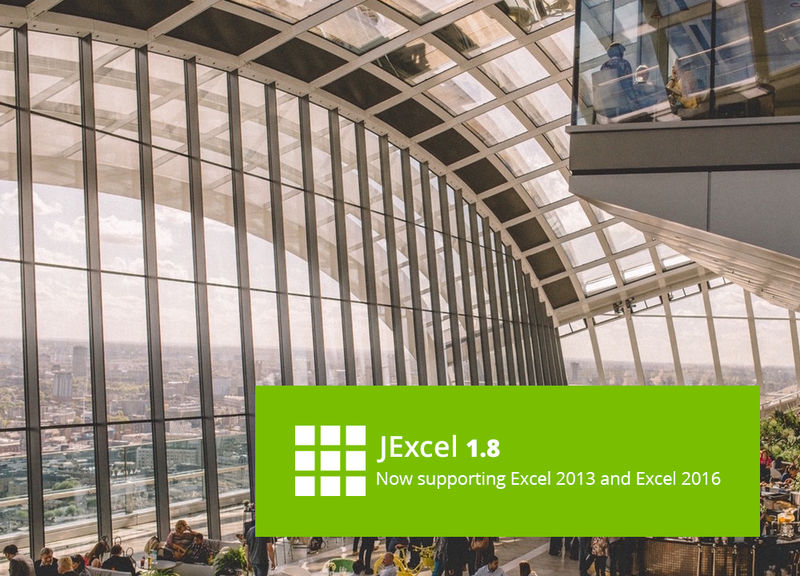 JExcel has been updated to version 1.8. In this version we have added support of Excel 2013, Excel 2016 and improved stability in multi-threaded environments. Check out the full list of changes and improvements on JExcel release notes page. Or jump right in and download the new version from the product page. We are always there for your thoughts and comments on JExcel support forum. JxCapture has been updated to version 3.4. In this update we have added support of El Capitan and support of multiple monitors on Linux. Several issues, reported by the customers, were fixed. Please see the full list of changes on the JxCapture Release Notes page. Feel free to download the new version and try it out. 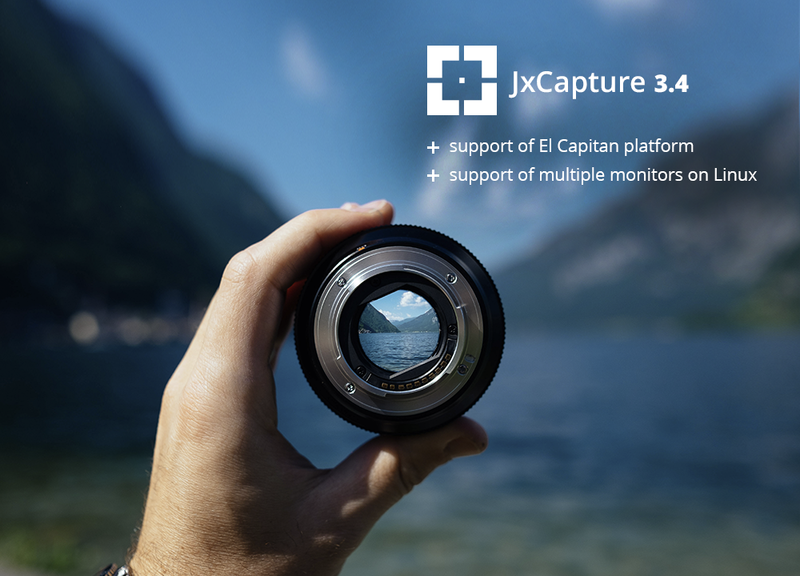 We would be glad to hear your feedback or provide help with use of our product on JxCapture support forum. JxBrowser 6.6.1 with Felix OSGi Support is Out! 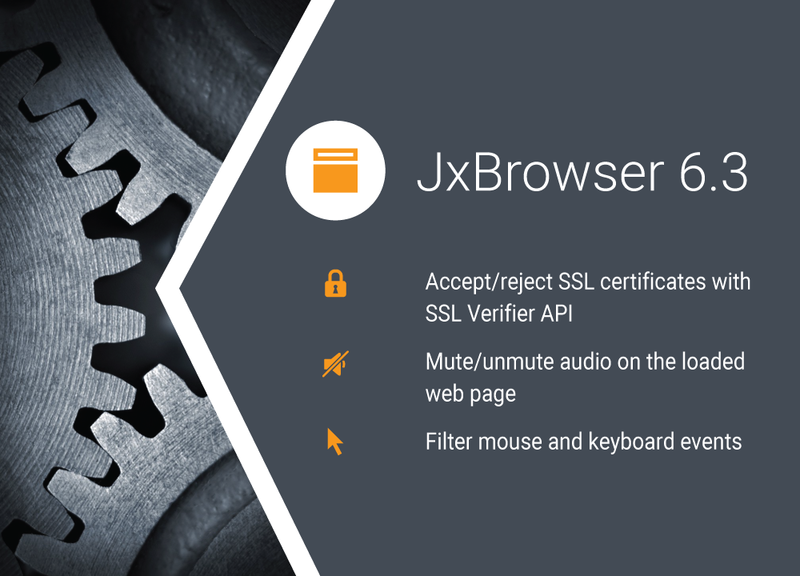 JxBrowser 6.6.1 is now available for download. OSGi support has been improved. Now JxBrowser supports Felix OSGi implementation. Stability in multi-threaded environment has been improved on Windows and OS X platforms. Interaction with PDF View plugin has been improved. 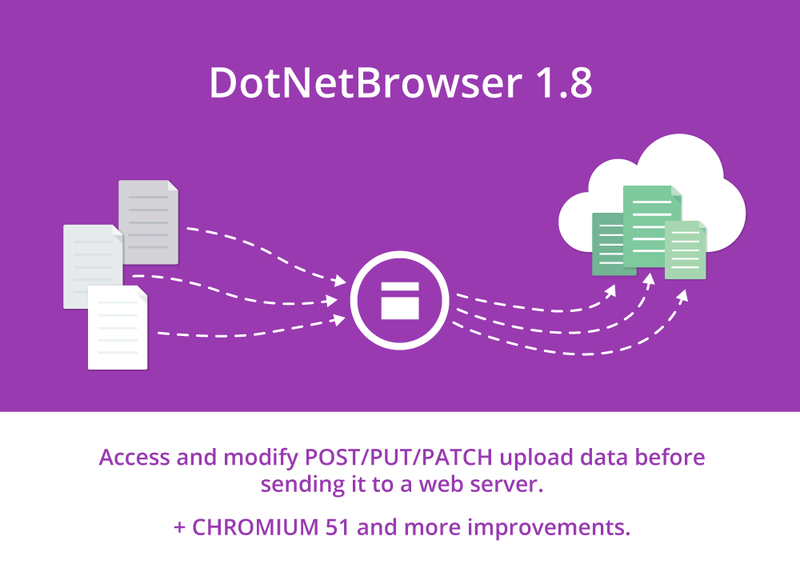 Apart from the upgrade of the underlying Chromium to version 51.0.2704.106 this DotNetBrowser release includes several important improvements and fixes to the library. Please see the Release notes for details. The version is available for download from the product page. We’d love to hear your thoughts or comments on the new version via the support emails or under #dotnetbrowser tag on Stack Overflow. JxBrowser 6.5.1 is Available for Download. In JxBrowser 6.6 we migrated to Chromium 51 engine that drops support of Windows XP, Vista, and Server 2003 platforms.JxBrowser 6.5 is the latest version that supports these platforms. In order to support some of our customers, whose products are still running on these platforms, we decided to release a minor update for 6.5 version with fixes for several critical issues. 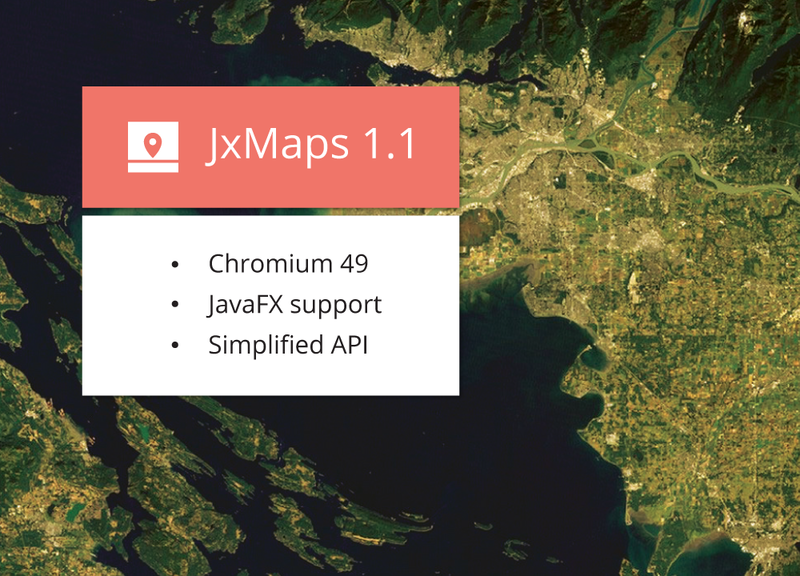 Happy to share the news of JxMaps 1.1 release. The new version is based on Chromium 49. Apart from this we have simplified the API and added JavaFX support. More details on this release are available in our release notes. Feel free to download and try out the new version, and make sure to share your feedback with us: send us an email or post a question with #jxmaps tag on Stack Overflow. TeamDev has been into WordPress plugin development for a while. We have launched a number of helpful plugins that even a non-developer can use to optimize their WordPress website: clean the source code from the unnecessary elements and make it SEO-ready, enhance built in search facilities, help adopt AMP technology, and more. Recently we’ve been in contact with Dave, a blogger from Belgium, who is the owner of a blog devoted to explaining WordPress technology. Now we are more than happy to reference his article about our Affiliate Links plugin for link shortening and masking, that he used himself, and decided to share his experience with his readers. The article is in German, but luckily, due to modern technology, a foreign language is less of a barrier every day. 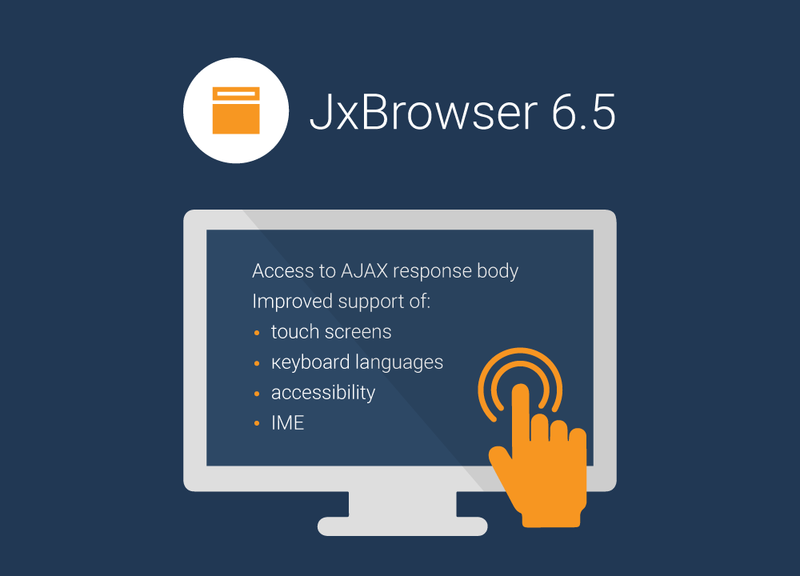 JxBrowser 6.6 is now available for download. The major change in this release is upgrade of the Chromium engine to version 51.0.2704.106, which also brings several changes to JxBrowser system requirements. In November 2015 Google announced the end of Chrome/Chromium’s support for Windows XP, as well as Windows Vista, and Mac OS X 10.6, 10.7, and 10.8, since these platforms are no longer actively supported by Microsoft and Apple. Starting with Google Chrome/Chromium 50 these platforms are not supported at all. Since JxBrowser 6.6 is based on Chromium 51, support of these platforms has been dropped as well. Except for Chromium engine upgrade, in this version we introduced a new functionality that allows receiving notifications when the spell checker has checked the text on the loaded web page. Using it you can get information about spelling mistakes on the web page. Several critical issues reported by JxBrowser customers have also been resolved in this update. For the full list of the features and improvements in this version, please see the Release Note record. 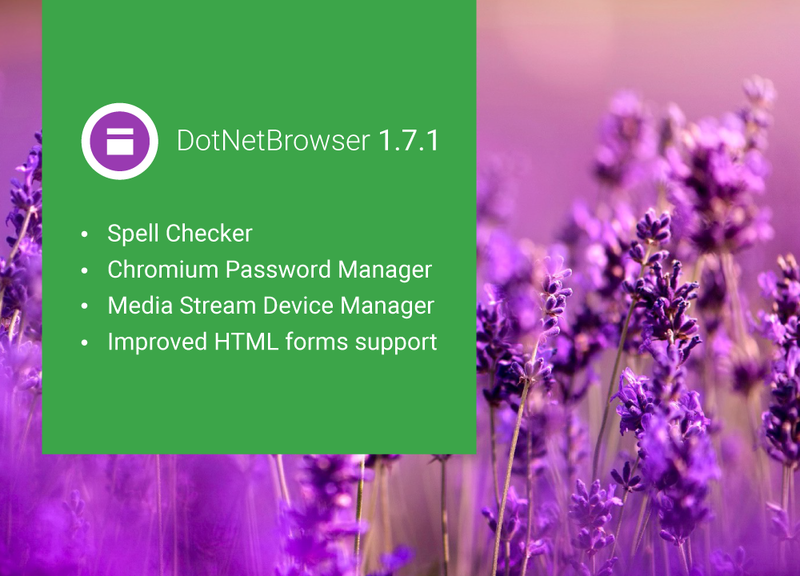 DotNetBrowser has been updated to version 1.7.1. In this release we have primarily focused on improvements and additions. Further, we have added support of two Chromium native features: spell checker and password manager. Full list of changes for your attention is, as always, at the DotNetBrowser Release Notes page. Post your questions, if any, on Stack Overflow under #dotnetbrowser tag and we’ll be happy to help you out! 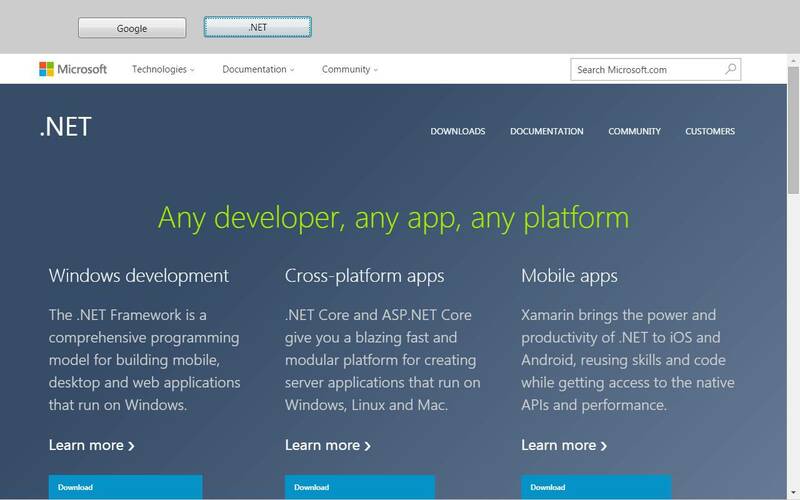 A new tutorial for .NET developers is out on Codeguru. In this practical guide Anna Dolbina, the lead developer of the DotNetBrowser, shows how to use it for building browser-based kiosk applications with WPF or Windows Forms. Have a great read and enjoy experimenting with this approach in your own applications! 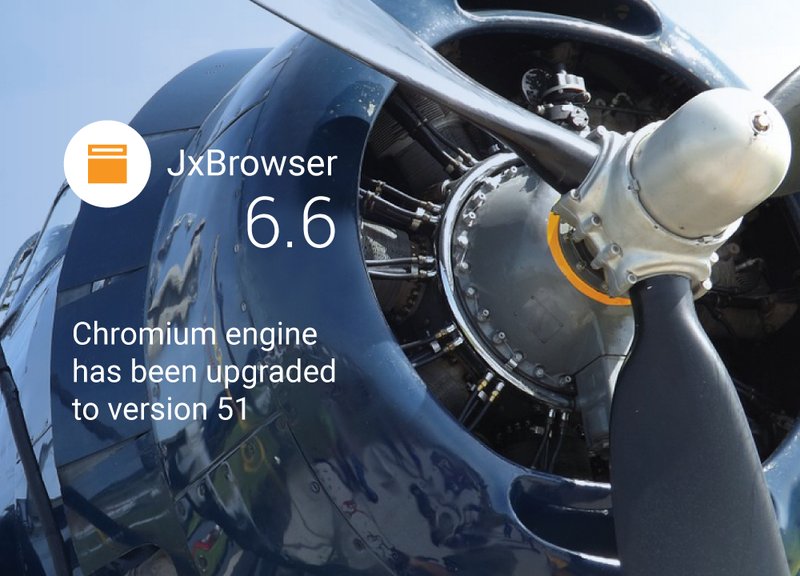 JxBrowser 6.5 is now available for download. In this version we focused on implementing features, long-awaited by our customers, such as access to HTTP response data to handle AJAX responses, multiple HTTP headers support, gesture event listener, getting selected HTML, better support of IME and different keyboard languages, and more. 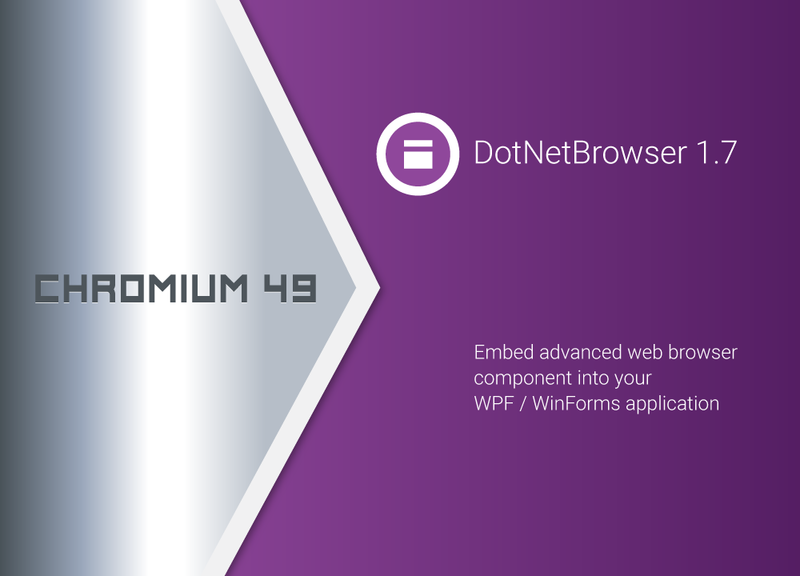 DotNetBrowser 1.7 now runs on Chromium 49! DotNetBrowser has been updated to version 1.7. In addition to the main change, which is upgrade of the underlying Chromium engine to version 49, this release contains some important updates. Also, we have applied fixes and improvements for the lightweight control rendering and added certificate validation API. See the full list of changes available in this release on the DotNetBrowser Release Notes page. As always, we'll be happy to answer your questions about our product on Stack Overflow under #dotnetbrowser tag. 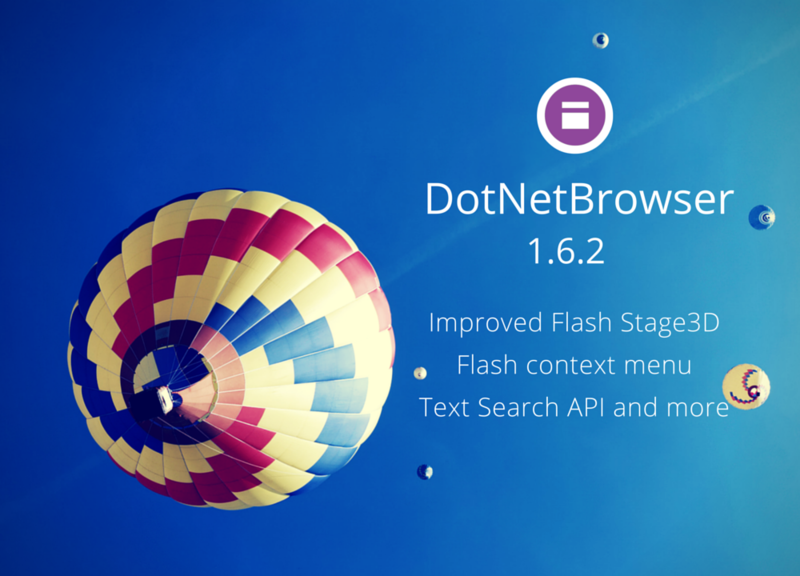 DotNetBrowser has been updated to version 1.6.4. We also invite you to ask us questions about the product on Stack Overflow under #dotnetbrowser tag, as we are moving our product forum there. 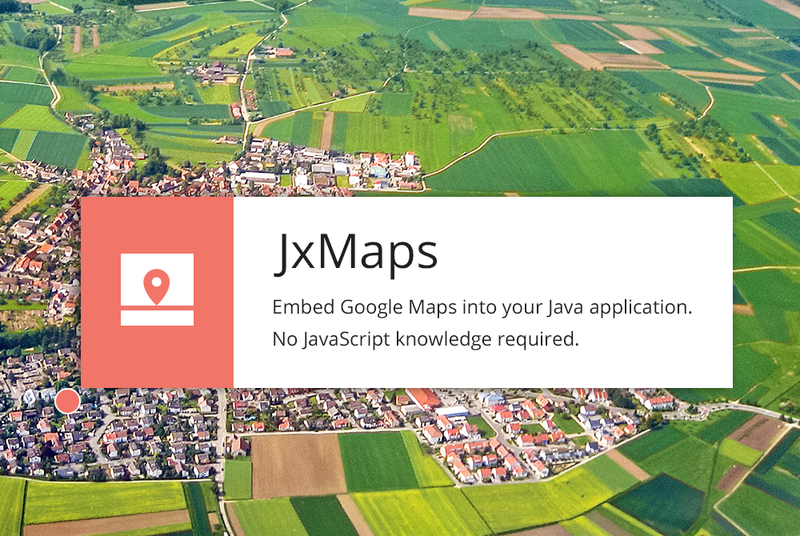 Great news for Java developers: Google Maps can finally be embedded into Java desktop applications, using brand-new JxMaps component, created by TeamDev Ltd.! Take a look at the Quick Start Guide and code examples for implementation details. You are welcome to download the library, and try it out with free 30 days evaluation. Know someone, who’s been struggling to integrate maps into Java app? Don’t hold it to yourself, share good news: https://goo.gl/ISncMO! Kiosk applications are used in a wide range of industries, such as banking, education, retail, travel, and entertainment, serving as information points, POS, and product promotion tools. Whenever it is possible to augment the human-attended service with automatic transactions, kiosks come in play. 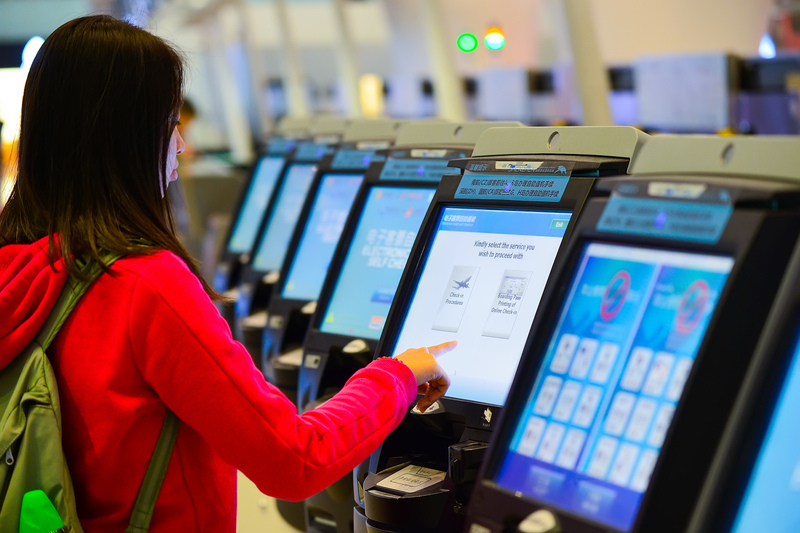 It is not uncommon nowadays to purchase a movie ticket, pick an outfit in a large store, or check-in on a flight in a matter of minutes using a specialized kiosk. When it comes to the development of application software for kiosks, there are certainly tweaks and tricks known to the industry. We’ve come across a frequently asked question of how to enable a browser-based application to be run in kiosk mode. Such an application would be easier to support, maintain, and upgrade compared to an app built on a specialized kiosk development platform. 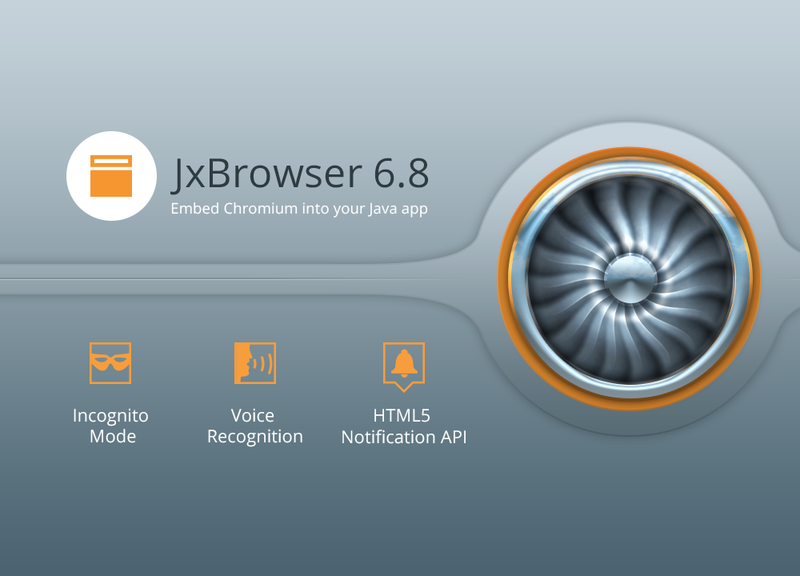 JxBrowser 6.3 is now available for download. In this update we implemented long awaited features such as mute/unmute audio on the loaded web page, SSL certificate verifier, mouse and keyboard events filters, etc. and fixed several critical issues. For Windows platform we signed JxBrowser binary files with our valid certificate, so Windows Defender won’t block JxBrowser process from running and end users don’t need to include JxBrowser process into the list of trusted processes. On Mac OS X Java 1.6 support has been restored as well. 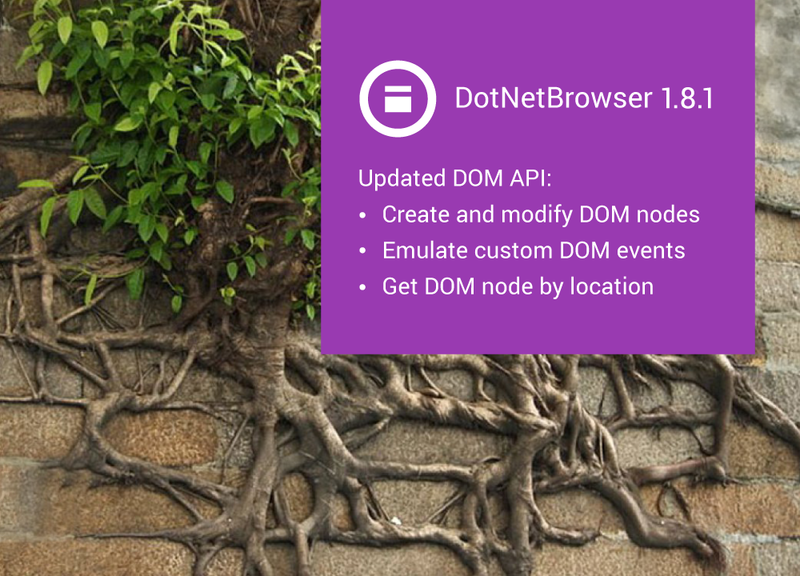 DOM API has been extended with functionality that allows getting next and previous sibling of a DOM node and more. For the full list of the features and improvements, please see Release Note record. DotNetBrowser has been updated to version 1.6.3. In this update we have implemented mouse and keyboard events for BrowserView, applied fixes and improvements for scrollbar behavior and text selection for LIGHTWEIGHT mode and added a customizable print handler for PrintToPDF() functionality. Please feel free to share your feedback or post help requests on DotNetBrowser support forum. DotNetBrowser has been updated to version 1.6.2. In this minor update we have implemented Text Search API, applied fixes and improvements for better Flash Stage3D support, added Flash context menu support and web cursors support. 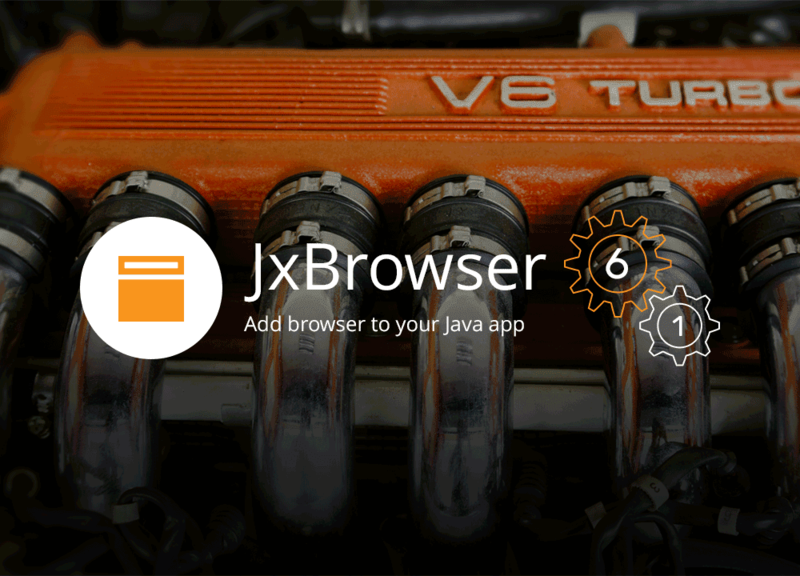 JxBrowser 6.2 is now available. In this update we implemented some long-awaited features. With this release JxBrowser introduces support of Windows Server 2016 platform and ability to listen to custom DOM Events. On top of the print functionality available previously, we have added the ability to print the selected text on a loaded web page and adjust print settings when user needs to save a web page as PDF. We have also introduced a brand-new Spell Checker API, support of HTML5 input element with type=color, and made more improvements. For those, looking for the full list of the features and improvements, we have prepared an explicit Release Note record. All these great new features are available in the new build ready to download. JxBrowser 6.1.1 with stability and memory usage improvements is available for download. In this quick update we improved stability of the library in cases of interaction with BrowserView control, such as setting focus, moving control from one window to another, and opening/closing control in JTabbedPane. We strongly recommend that your upgrade! The list of all fixes and improvements in this update is available on the Release Notes page. LocalStorage and SessionStorage API that allows working with HTML5 web storages from Java has been implemented. Several critical issues reported by our customers have been fixed. Stability and memory usage in Chromium engine have been improved. Data transferring between Java and Chromium processes now works ~10 times faster. The list of all new features and improvements in JxBrowser 6.1 is available on Release Notes page. 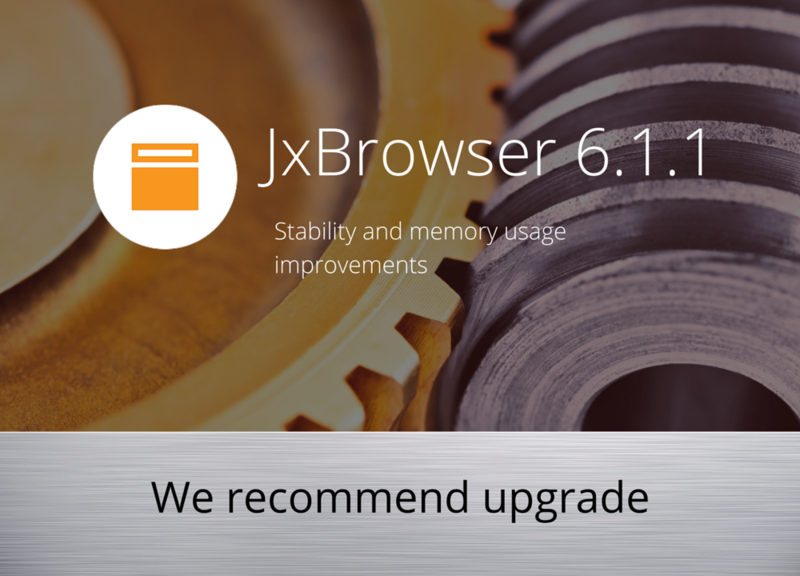 We strongly recommend that your upgrade to JxBrowser 6.1 because this version solves critical issues that might affect stability of your software. XPath API and Improved Video Support in DotNetBrowser 1.6.1! 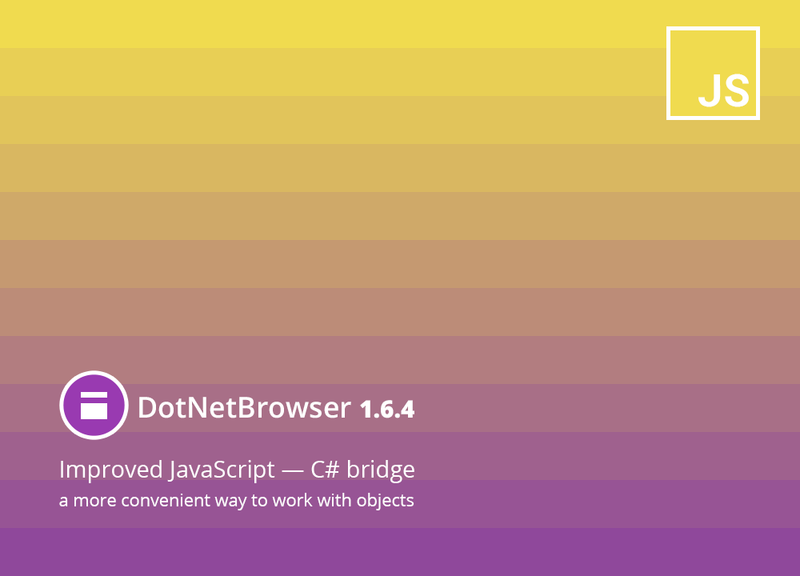 DotNetBrowser has been updated to version 1.6.1. In this minor update we have implemented XPath API, applied fixes and improvements for better video support (HTML5, Flash, Silverlight), and improved stability in Windows 8/8.1/10 environments. As always, we would be glad to hear your feedback or provide help on our product on DotNetBrowser support forum. Faster and leaner web-browsing became buzzwords of the day as one of the Google web performance engineers announced, that Brotli data compression algorithm is to be implemented in Chrome browser. Brotli developers promise up to 26% increase in compression performance compared to currently used Zopfli algorithm, which means faster load times and less resources necessary to render web content. 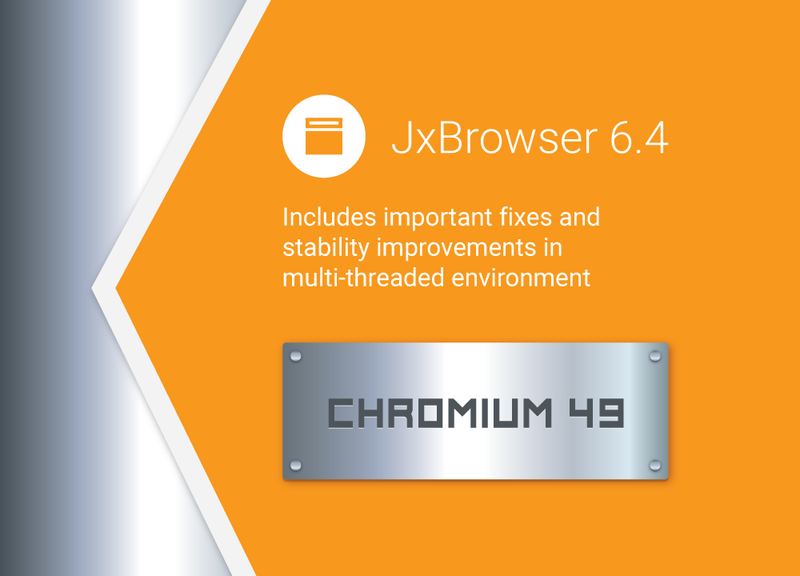 JxBrowser team is full on preparing a new JxBrowser 6 update, based on the latest Chromium version with Brotli support included. Stay tuned for the latest release news. 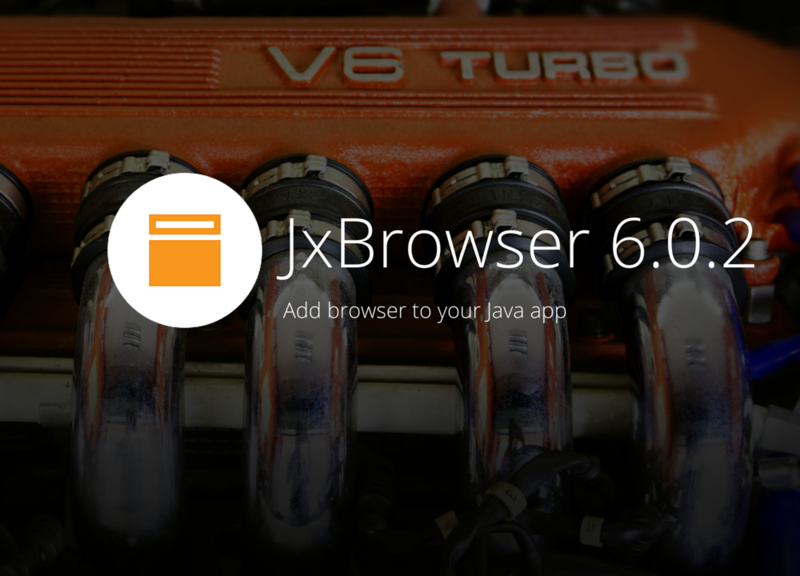 JxBrowser 6.0.2 is now available for download. This update includes several enhancements such as Adobe Flash plugin support on Linux 32-bit and 64-bit, a new API for getting notifications when in lightweight rendering mode web page has been repainted. Also, the update addresses several critical fixes that improve library stability and memory usage. We recommend that all developers who use JxBrowser 6.x upgrade to this version. 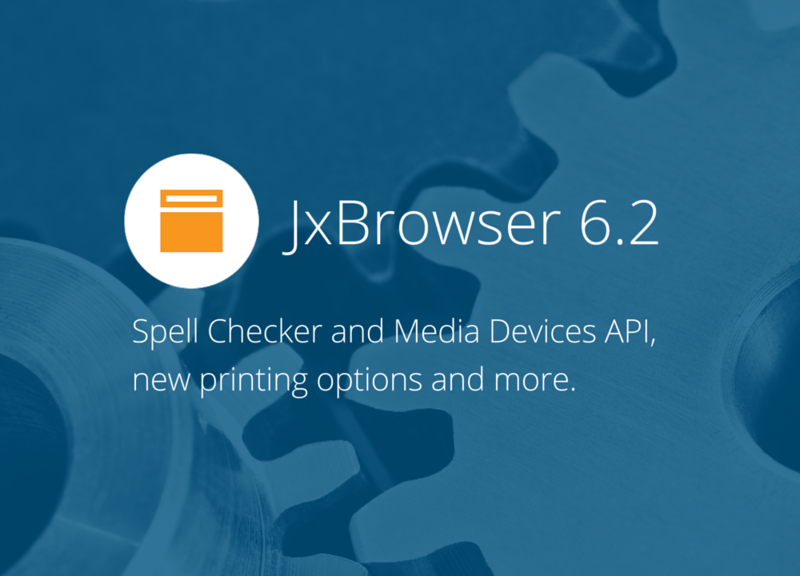 The list of all changes in JxBrowser 6.0.2 is available on the Release Notes page.